Hire C++ developers whenever you want to develop desktop applications to work with external hardware, connect to the Internet, or process data, images and sounds. Our highly-qualified, experienced team is here to support all of your project objectives, be they big or small, and ensure that your company remains at the top of its game. We use the latest C++ programming language for both high-level and low-level programming, including development operations with RAM, addresses and ports. Our products are multiplatform, meaning that they’re practically universal and thus compatible with multiple systems, including Windows, Unix and Mac. Since our goal is to make you look good, no aspiration is too lofty. Bring us your best and brightest concepts! We design software for embedded systems with data analysis functionality, and all of our desktop applications are furnished with an intuitive, user-friendly interface, making final product usage easy and convenient. Submit a request for proposal today and let’s work together to breathe life into your ideas! The solution constructs and visualizes personalized stitch figure models, which represent the best performance a concrete sportsman may show, considering his body parameters. It employs statistics to evaluate the maximum human body segment effort possible, resulting in representation of how the sportsman’s performance compares to the elite performance. The year after it was built, the application has helped to the athlete, who used the app while training, to win the Olympic gold and to hold a world record. HireRussians has been instrumental in helping us develop our sports based video analysis system. We have been working together for over a year and they have demonstrated excellent development skills in a complex, evolving project. In addition, their attention to customer service and satisfaction has been very welcome. I give them an excellent overall rating. This solution, built in C++, allows unmanned network cameras management while capturing hockey events. For this purpose HireRussians have developed a proprietary movement recognition and prediction algorithm. 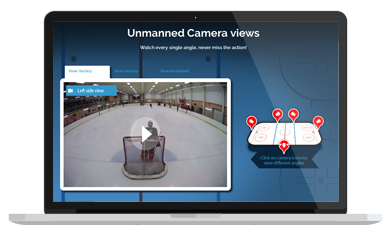 The cameras, installed in different zones of the rink, are switched automatically, as the play tracking technology follows the action on the rink. The algorithm was also adapted for soccer and is offered by our client as a SaaS solution. I'm actually pleased with what I am seeing, your people have done a great job. This is a multiplatform music management app, developed from scratch with the use of Qt technology. The app is rather sophisticated and in some extent similar to iTunes, with a built-in audio player. It allows users to create playlists, play tracks in order, or random, stream music to any device within the user's home network or play it directly on the PC. The app works on both, Windows and Mac. I must say I am impressed. I am impressed not just by the quality of their work, but by their ease of communication, their professionalism and their honesty.